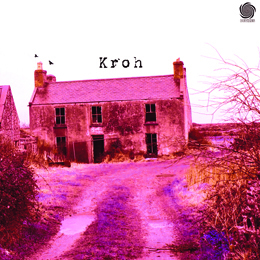 Two man band Kroh brings to the table a mixture of several different metal genres that some might say shouldn’t may be crossed. Their style is a cocktail of industrial, shoegaze, alt rock, sludge, doom and 70’s rock. Musically, the band is pretty tight and adventurous. The guitars maintain a fuzzy sound and hovers between the kinetic drums and 70s horror bands such as Jacula, Black Land, Antonius Rex–like synths, all done by multi instrumentalist Paul Kenney. Focus on the vocal presentation of Francis Anthony, which is a cross of a polished Blackie Lawless and tempered Trent Reznor. Anyone who likes their metal with crunchy guitars, attitude-laden vocals and well-written, hard-driving songs will like this CD. As mentioned above, the high lights “The plant we seeded”, the very dark “Inside” and “Fruits and wine” bring to mind the work of Black Sabbath, Nine Inch Nails, Wasp, Black Widow, A Perfect Circle,…- but all in a Kroh kind of way. Hell, even the not-so-great songs still manage to be forceful and stylish. They’ve done something pretty original, and therefore it’s worth a spin.